I just shredded every last file off my computer of this horrendous PAIN of a program. It CANNOT even log in. Had the same problem with this program a year ago. It works for two days then it quits working, then you have to attend computer classes to fix it. In this case it couldn't be fixed by Einstein. It can't log in because it erases the settings on first run. When it does that Eve wants a verification code. In order to retrieve the verification code you must turn OFF the bot. Then it starts again. I personally have had it with this bot. Wont ever order it again. Dont go away. 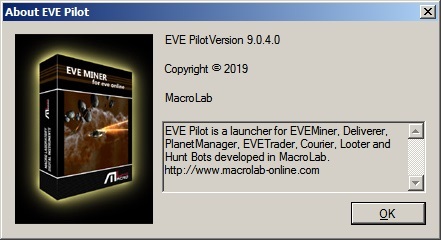 Everybody may have problems after quite big eve update like launcher switch. I am working hard to fix them fast. 9.0.4 version will have manual login implemented. Bot will be paused if you need to enter activation code to login. Going to publish new version in a few minutes.